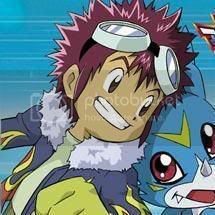 Daisuke is a human being from the Digimon Adventure 02 canon. Daisuke is a very optimistic kind of guy and at the same time very stubborn. This can make him appear to be rather thick-headed at times (and often this is the case) but he always tries his hardest to succeed in what he does. He is obsessed with soccer and sometimes likes to show off. He's outgoing and friendly as well, easily making friends (when he isn't acting slightly bratty but usually this only occurs when it involves his sister). Although he often rushes into things and makes mistakes, his courage in the face of outstanding odds can't be denied. No matter how dire the situation, he always believes that everything will turn out alright in the end (this going back to him being optimistic). Daisuke grew up in a family consisting of himself, his two parents and his "annoying" older sister Jun. His first experience with digimon actually occurred long before he met V-mon, he was one of the children captured by Vamdemon during the digimon's invasion in the real world. However, being so young at the time, he sort of forgot about it. A few years later was when his real adventure in the digital world began. Daisuke was eleven when Taichi released the D-3 devices that were sent to Miyako, Iori, and himself and after releasing V-mon from the digimetal of Courage he accepted his role as a chosen child (more or less). Although he doesn't take this responsibility completely seriously until Taichi hands over the role of "leader" to him by presenting him with the googles he had worn up until that point. Their first enemy for the series is the Digimon Kaiser who is trying to take control of the digital world one control spire at a time. Daisuke is actually the first to learn of his true identity after a scuffle that leads him to notice a wound he had given to Ken Ichijogi earlier that day. It seems to be after this that Ken really cracks down on his role as the Kaiser and "runs away" from home in order to rightfully take his place as ruler. Daisuke and the others can't have this of course and eventually confront him in his base, Daisuke receiving a third golden digimetal that had been powering the base: the digimetal of miracles. Magnamon with the help of Wormmon defeats Kimeramon and gets Ken to see sense. The Chosen get a brief break after this but it is short lived when some of the older Chosen begin disappearing. Daisuke receives and email from Hikari about it and travels with Iori and Miyako to the United States to help her and Takeru. On the way, they meet Wallace, a Chosen from Colorado, whose partner was the cause of the problems and had been corrupted some time before. Eventually they are dragged back to Colorado where they thought Cherubimon was telling them to go back to…however he really wants them to return to three years ago when he was first infected. Daisuke used the digimetal of Miracles again so Magnamon could help Rapidmon defeat Cherubimon and end Kokomon's pain. Daisuke and the others then returned to Japan. After they return Daisuke and the others take it upon themselves to start clean up in the digital world by destroying the control spires that the Kaiser had put up. It is during this time that Daisuke gets V-mon to evolve normally and is the first of the 'new' kids to do so. He was also the first to forgive Ken for his transactions against them during his time as the Kaiser and, being the appointed "leader" of the new kids, eventually convinced the others that Ken was alright. This may prove to be the reason why he was the first to be able to jogress evolve with Ken as his partner. Daisuke's moment to shine was in the final battle with BelialVamdemon. Daisuke was the only one willing to fight, and fueled by Dasuke's courage and determination, XV-mon attacked BelialMyotismon, causing some damage. While the other children were caught in their dreamworlds, unable to let go of their desires, Dasuke seemed to have remained untouched. Instead he went to each of his friends and helped bring them back to reality. Even then, they were not sure whether they could win or not and were too afraid to try. But Dasuke, ever optimistic, encouraged them to give it a shot. It has been a few months since this occurred when Daisuke was brought to this "new" digital world. Daisuke first finds himself in the forests of D'Ango very confused as to how he got there without the use of a digital port. He and V-mon almost immediately start walking (presumably in circles) in search of the others they know to be out there. His first encounter is with a much older version of Koushirou and the ninja Yuffie, the later of whom seriously freaks him out with talk about him and Ken being 'more than friends' and he gets the heck out of there…quickly loosing himself again. It was after this that V-mon and Daisuke hitched a ride with a Whamon and met Demyx for the first time, the two quickly became friends probably due to their easy going nature. Demyx was in search of friends of his own so Daisuke agrees to help him out since he is "familiar" with the digital world. However their search is cut short when they are both captured by Shego during her plot to take over the digital world. Daisuke tried to resist and even fought back but Shego greatly overpowered him and he ended up not only badly burned and getting hit in the face by Demyx's sitar but also losing V-mon. They are released shortly after though and quickly run into Axel and Roxas, the friends Demyx had been searching for all along. Roxas is able to heal Daisuke's wounds with the keyblade and Daisuke joins their group for a short time until V-mon's egg hatches. It isn't until Christmas that Daisuke finally gets his partner out of the egg and he is overjoyed by his 'present' and he even manages to get the digimon to evolve all the way to Chibimon. Soon after Daisuke runs into Ryo and is curious as to why Chibimon seems to know him. It is soon revealed that his Chibimon was partners with Ryo in the past and is good friends with him, although Ryo believes that Chibimon should have forgotten him. Unknown to Daisuke, Ryo was apparently worried about Daisuke sharing this past with others so to keep and eye on the goggle head he invited him to join his group which, then, consisted of Molly and Takato. Daisuke's V-mon has also been partnered with Ryo in the past. In Daisuke's timeline his sister, Jun, just started dating Yamato. Daisuke has a horrible sense of direction despite the fact that the D-Comm has a map function and is constantly getting lost. Daisuke really, really wants a soccer ball and has agreed to teach Molly how to play.